Hey all you students and parents out there! Since it’s almost back-to-school time, I am giving away a copy of The Secrets of Top Students: Tips, Tools, and Techniques for Acing High School and College. All you have to do is click here to enter. Rules: NO PURCHASE NECESSARY. The 50th eligible entrant will win. This giveaway started Aug 14, 2015 10:16 AM PDT and ends the earlier of Aug 21, 2015 11:59 PM PDT or when the prize has been awarded. What is the first thing you should do when taking a math test? What is an often overlooked place for coming up with a thesis? What music should you listen to while studying? Why is it bad to be a perfectionist? What are the good and bad types of motivation? What foods should you eat to boost your brainpower? How much do top students really study? Should you bring your laptop to class? What are three game-changing learning techniques? 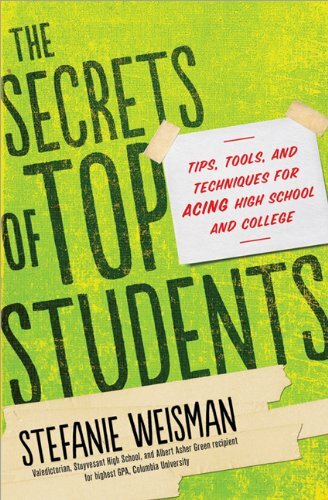 Written in a conversational, down-to-earth manner, The Secrets of Top Students shows you how to maximize your learning and get the grades you want. Filled with innovative, time-saving techniques, this book also includes advice on motivation, the mind-body connection, and technology inside and outside the classroom.